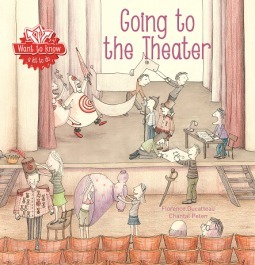 This children’s picture book is, as the title suggests, a story about the theatre – what it’s like to go and watch a play, and what it takes to put on a play. All in thirty-two pages or less. So of course it is a very much abbreviated story. As a theatre professional, I am very much in favor of anything that might get a child interested in seeing or working in theatre. But I’m not sure this book will do that. The pictures are cute and the basic story of a group of school children going to see a play is something that children should be able to identify with. The choice of plays to go see, Cyrano de Bergerac and Ubu Roi, is very, very odd. Most Americans who might pick up this book will likely never even have heard of Ubu Roi (though I hope they will have at least heard of Cyrano de Bergerac). And it’s not surprising…Ubu Roi is a strange, difficult play, often considered to be the precursor to the Theatre of the Absurd that was championed by playwrights such as Eugene Ionesco. Cyrano, while not a strange or absurd play, is still an odd choice for school children. This book is clearly written by and for the French, who would be much more interested in plays from French history. The listing and description of those who work in the theatre is a little complicated and dry. The real problem with the book is that it tries to do too much. This is a crash course in theatre history told in 30+ pages – from acting exercises, to different types of theatre, to how to put on a puppet show. This is the sort of book that I would have in my house because of my work in theatre, but I can’t see reading this to my children (or grand-children) more than once, and repeat reading is a key feature of picture books. Looking for a good book? Want to Know: Going to the Theater is a children’s picture book that offers some good information about the world of theatre, but tries to do a little too much and many readers will find this confusing.